Skybridge to open a subsidiary in Piraeus, Greece. Skybridge SAS to demonstrate its commitment into the Greek maritime market established a new , fully owned, subsidiary. The name of this affiliate is Royal Blue. The new entity will address local markets and will operate a fully crewed, 77ft wooden ketch for demonstration and R&D purposes. 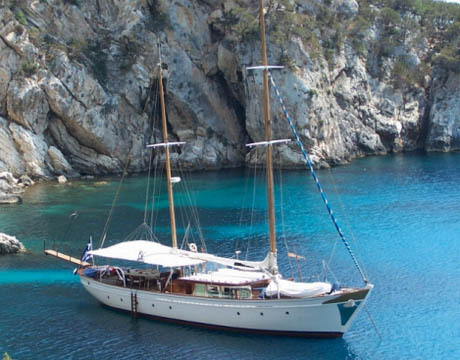 This yacht used to belong to Mr. Latsis, a well-known Greek ship owner and was built in 1964. It is a truly callsic ketch with lot of history behind. She is located very close to the port of Piraeus, at Marina of Zeas, ideally situated for visits across every Greek island. This unit will also be used as showroom for our luxury yacht market segment. She can accommodate 9 guests with en-suite facilities.